Olga Seryabkina, beautiful and talented girl, singer – songwriter, ballet dancer, sportswoman and interpreter was born on April 12, 1985 in Moscow. She is known as a member of girl pop group “Serebro”, which took the third place at the Eurovision Song Contest 2007. At age 7 Olga Seryabkina began taking ballet classes. At the age of 17, she got the rank of the candidate to the master of sports, and she took part in many international competitions. From 2004 to 2006 she worked as a backup singer/dancer for the Russian singer Iraklij. In 2008 Olga participated in “The stars motor racing” in Yarkhoma Park and was the winner. Olga began to study ballet at the age of seven.and the same year she got the rank of the candidate to the master of sports. Seryabkina graduated at the Art School, the Department for Estrada and Pop Singing, and in 2006 got the higher education diploma on specialization “Translation and Entrepreneurship”. Olga was brought to the audition for “Serebro” by her friend Temnikova. 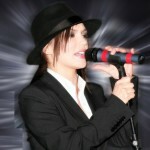 As one of the band members, Olga is the only member to produce and write most off the songs for the group as well. She first had her writing debut on the groups single “Like Mary Warner”, and write and composed some off the songs featured on Mama Lover.